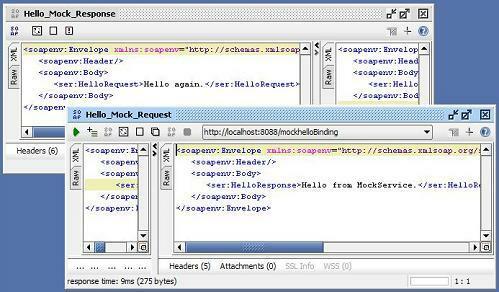 This section provides a tutorial example on how to submit a test request to the mock service. Requests and responses can be viewed on both sides: client side and server side. Now let's to submit a test request to the MockService. 1. Continue from the previous tutorial. 2. Right click on "Hello" under "helloBinding" binding in the project object tree and select "New Request". A small dialog box shows up. 3. Enter "Hello_Mock_Request" as the request name and click OK. A new request will be created in the request editor. 4. Enter "Hello again." in the HelloRequest element. 5. Click the endpoint dropdown list below the title bar and select "Add new endpoint...". A small dialog box shows up. 6. Enter "http://localhost:8088/mockhelloBinding" and click OK. The mock response received from the mock service will be displayed. "helloBinding" - Representing the client side to send a request to the mock service and receive response from the mock service. "helloBinding MockService" - Representing the server side to receive a request from a client and send the mock response to the client.